If you're friends with me on Facebook... You'll probably understand why I haven't had many opportunities to sit at a computer and write on the blog! We have gone from having one dog to three dogs in just a couple of short days! Terry and I had been keeping an eye out for another small dog to adopt so that Parker has someone to hang out with while we're gone all day at work. While we were looking, I came across a dog that was found in Eau Claire on the ECCHA's Lost Dog Facebook page. He had been found on Valentine's Day and looked terrified. A couple of weeks had gone by and I noticed that this dog was still not up for adoption so I commented on the picture, asking if he had been claimed. The ECCHA stated that they were looking for "other options" for him. Shortly after that, I was contacted by a girl who works for Gentle Touch Animal Sanctuary in Minnesota. She told me that Bruiser was scheduled to be euthanized since he did not pass all portions of his "safer test" (this is a test that all animals must pass before being up for foster or adoption... it includes portions such as toys, food, sensitivity, look, etc) and ECCHA did not want to be liable if Bruiser were to bite anyone since he was growling at people he was unfamiliar with. 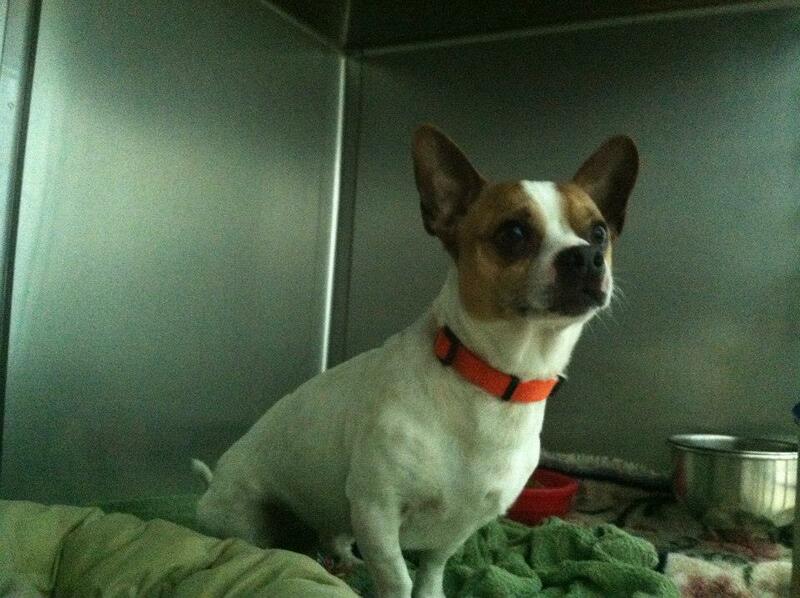 In order to save Bruiser from being euthanized, another facility would have to take Bruiser on and be liable for him. Stephanie from Gentle Touch thought that he was worth the risk. However, she needed to find someone in Eau Claire to foster him for a few weeks until he was able to (hopefully) be up for adoption. Terry and I had come across a chihuahua/dachshund mix dog named Carmelita at the Clark County Humane Society. We applied for her right after chatting with the staff and volunteers at the Clark County Humane Society since her personality seemed to match Parker's perfectly (at this time, we were unsure what was going to happen to Bruiser). Bruiser was dropped off at our house on Thursday evening and on Friday afternoon, we drove to go pick up Carmelita in Neilsville! Gentle Touch wants Bruiser to live with us for at least 3 weeks so that we get to know him and assure that he is ready for adoption. I'm not exaggerating when I say that this guy could go to his forever home today, if the home were the right match for him. He is AH-MAZING. Seriously, he's such a little ham. We took him to Petsmart yesterday and he was on his best behavior. He blows me away every day with his awesome personality and loving heart. I can't believe anyone in this world thought this dog was a "liability" or "vicious"... He's the sweetest thing. If you are even remotely interested in adopting Bruiser or any dog for that matter, DO IT! These dogs have been abandoned, forgotten about, or even worse... abused. These dogs will be forever loyal to you if you welcome them into your home. They are looking for nothing but your attention and love. Let me know if you want to meet Bruiser - he will win your heart over in just a beat! These dogs have definitely put a little extra pep in my step! I ran 9 miles yesterday and was STILL excited to get home and take them all for a walk. It's so much fun to walk in the door and have 3 dogs go crazy to see you (even if you've only been gone for several minutes.. hehe). A little shout out to my MAIN man, Terry, for being so amazing and supportive during this entire process. He has been so great with the pups and helps out with everything from walking, bathroom breaks, feeding, etc. B & C definitely understand Parker's (and my own) obsession with the guy ;) Thanks, babe!